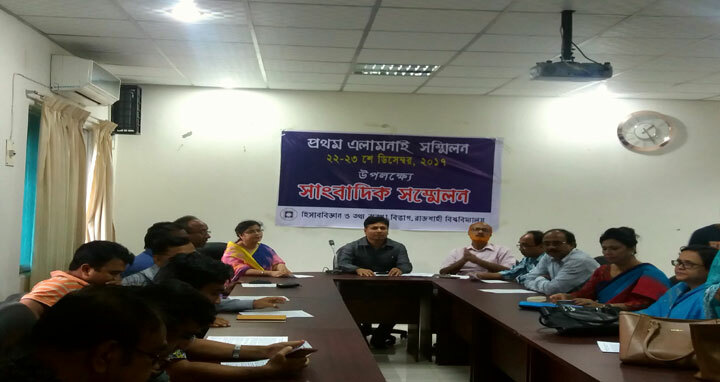 Rajshahi, 26 July, Abnews: The first Alumni Association of Accounting and Information Systems (AIS) department of Rajshahi University (RU) will be held on December 23-24. Convener of Alumni Association committee Professor Dr. Mohammad Main Uddin informed this through press conference held at Teachers Lounge of Rabindra Bhaban on 26 July 2017. The present and former students of the department are requested to be member of the association within October 31 to participate the program where registration fees are Tk. 500 for present students, 1500 for former students and 1000 for guests. The membership form for the association will be available on university official website www.ru.ac.bd and in the department. Chairman of the dept Prof. Dr. Salma Banu, Prof. Dr. Subhash Chandra Sil, Prof Dr. Humayun Kabir, Prof. Dr Dil-Ara Hossain, Prof. Dr. Sayaduzzaman, Prof. Dr. Md Tazul Islam, Prof. Dr Md Ahsan Habib, Prof. Dr. Rukshana Begum were present at the conference.